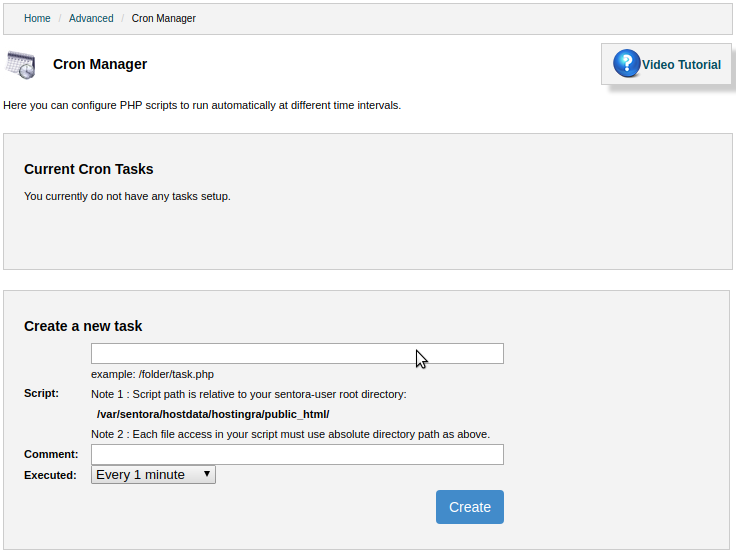 Cron Manager Module is a time-based job scheduler which will set up and schedules jobs to run periodically at fixed times, dates, or intervals.This module makes easy for the user to set up scheduled jobs, and avoid having to create or edit a cronjob each time you want to make a change to a scheduled job. This module will check whether the mentioned path is present or not on the server, if not it shows the message saying: Your script does not appear to exist at that location. So it will reduce your work and time, you just need to give the proper path of the script which you have written, then enter the comment for knowing for what reason you have set the cron job, next you need to select the time interval from the drop-down as per the schedule required,Once you did with this you can click on create and cron job will get scheduled and runs as per the time interval which you have mentioned. 1. Enter the Script path under the text box provided. 2. Enter the comment under the text box provided. Ex: Send the renew email every 1 hour. Purpose of comment is like sticky note which will tell us what job is going to happen. 3. Select the time interval from the drop-down menu. 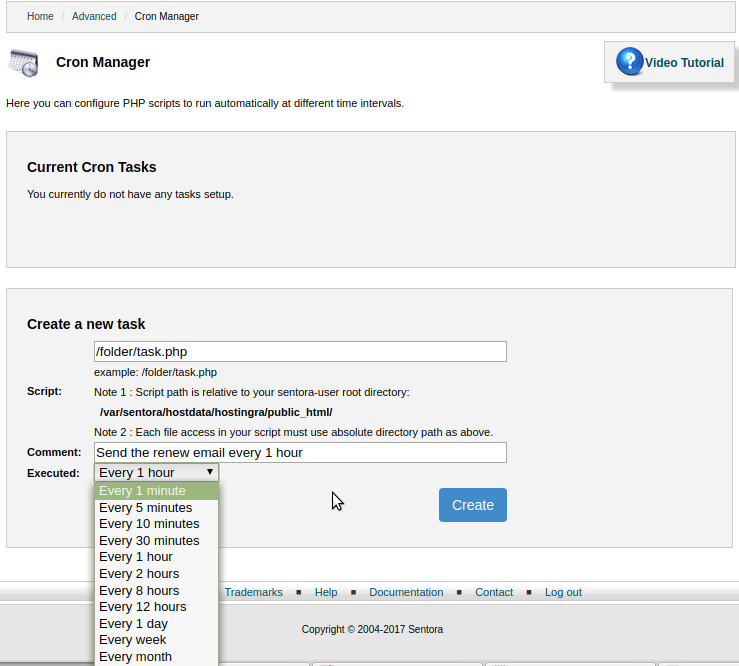 When you wish to cancel the Cron Tasks simply click on delete.It will be deleted and you can see no Cron task will be left once you did with deletion.Ex: Every 1 hour. You can select any of time intervals mentioned under this drop-down as per your requirement. 4. 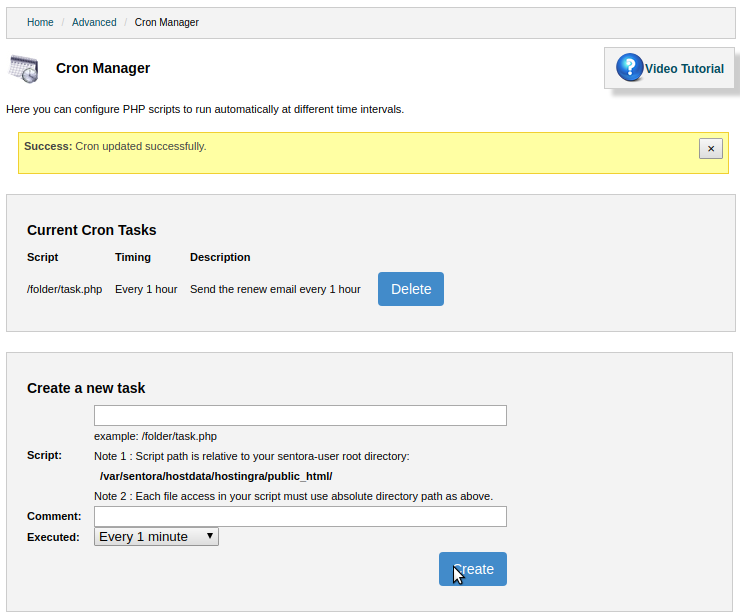 Press create to schedule the new cron job. When you wish to cancel the Cron Tasks simply click on delete.It will be deleted and you can see no Cron task will be left once you did with deletion.